Samantha Hargrave, born in the slums of Victorian London, dares to dream of becoming one of the first women doctors -- and surgeons -- in America. 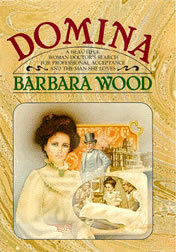 Set in London, New York and San Francisco from the late nineteenth century into the early days of the twentieth, Domina tells the story of a courageous woman with a special gift for healing, who struggles to enter the all-male profession of medicine. When her ambition meets with hostile rejection in England, Samantha sails to America, where she meets a mysterious doctor with a dark and troubled past who takes her on as an apprentice, thus beginning her life in the world of medicine that turns into an odyssey that takes her into the back alleys of America's teeming cities, into the drawing rooms of the fabulously rich, leading her ultimately to her destiny, and the man she once loved and lost.